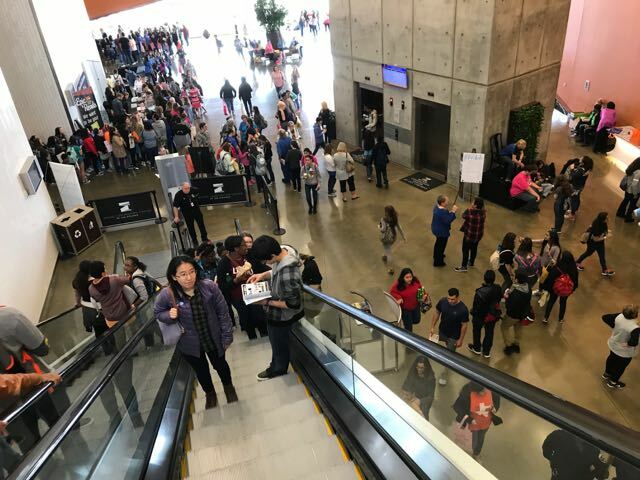 The North Texas Teen Book Festival is, quite simply, one of the coolest book events in Texas, and I said this before they asked "Revenge of the Star Survivors" to be a part of it. Can you spot the "Star Survivors"? If so, thank cover designer Mark Cabuena. I will acknowledge that it was just a little intimidating, being lumped in there with all those other really great writers. But the truth is, I think I fit right in. The best part of all is the crowds. I love meeting people. And I try not to let the lines at my table intimidate the younger people around me. Fortunately, this is never a problem when your last name begins with "M" and you are at an event with the likes of Julie Murphy and Sarah Mlynowski. I will say that the volunteers running their signing lines had a LOT of work to do. Whereas the volunteer in charge of mine had to stand around and engage me in conversation. So I post this selfie with her as a salute to all book festival volunteers everywhere. Thank you for taking on the really tough jobs. But just to be clear – the event is a spectacular one. If you love books and love the idea of being around 10,000 teenagers who feel the same way, it's a little bit of heaven in Irving, full of truly inspirational moments. Wait. Let's pretend that didn't happen. Here – thousands of people who love books. Join them next time.